THE LOLË WHITE TOUR IS GOING ON THE ROAD. SINCE 2016, THE LOLË WHITE TOUR ON THE ROAD HAS BROUGHT COMMUNITIES ACROSS EUROPE, CANADA AND THE UNITED STATES TOGETHER FOR SPECTACULAR YOGA SESSIONS DEDICATED TO PEACE. THIS SUMMER, COME EXPERIENCE ONE OF THESE EXTRAORDINARY YOGA SESSIONS, SURROUNDED BY HUNDREDS OF PEOPLE DRESSED IN WHITE AND WITH THE SOUND OF LIVE MUSIC, ALL IN AN EXCEPTIONAL PLACE NEAR YOU. WHAT’S THE DIFFERENCE BETWEEN THE LOLË WHITE TOUR ON THE ROAD AND THE OFFICIAL LWT EVENTS IN MONTREAL (AUGUST 18) AND TORONTO (JULY 26)? The Montreal and Toronto events are the official stops on the 2018 Lolë White Tour. 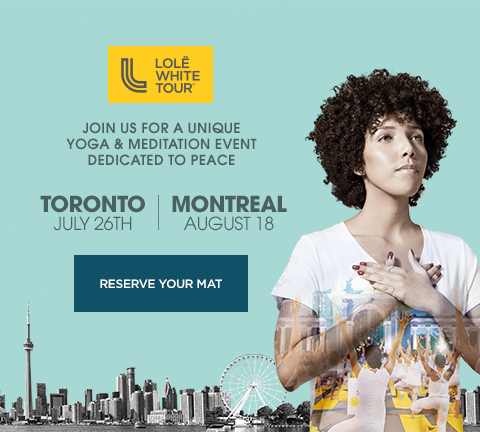 Following the popularity of the Lolë White Tour®, Lolë launched in 2016 a licence concept taking the tour to the next level with a series of more intimate yoga events organized by Lolë communities. When will the Lolë White Tour On The Road® begin? Several Lolë White Tour® On The Road events are scheduled around the world, between june and september 2018. Consult each events for more details. The ticket price is the same for most events. This price includes: a Lolë yoga mat, a gift bag and a Lolë promo card. Consult each events for more details. What is the schedule of the events ? Who are the Yoga Teachers for the events? Teachers are different for each event, consult each events for more details. HOW CAN I BECOME A VOLUNTEER FOR THE EVENTS? The events are organized by our Lolë stores in each of the communities. Please contact the staff of the participating Lolë stores directly. 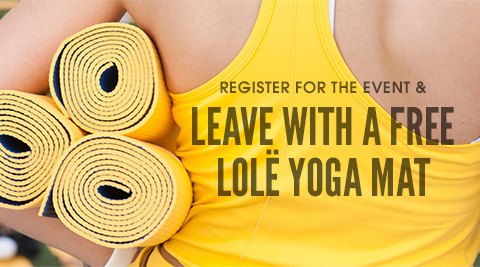 WHAT ARE THE TECHNICAL SPECIFICATIONS OF THE LOLË YOGA MAT SUPPLIED FOR THE EVENT? The yoga mat provided to each participant is non-toxic and hypoallergenic. It does not emit any odours and is very light-weight. It is made of a Polymer Environmental Resin (PER). To care for your mat, simply clean it with water. Due to the high number of participants, we recommend you to us arrive already dressed in your white yogawear. Plus, it will be a great deal of fun to see participants walking around town wearing all white as a badge of honour! IS THE EVENT CANCELLED IF IT RAINS? The event will take place rain or shine, so no excuses! Should the forecast call for extreme weather conditions that could cause major delays or changes, we’ll let you know within 48 hours of the event. You might want to have a light white jacket or a rain poncho ready just in case! Your Lolë White Tour ticket is a firm sale, so it is not refundable. You can, however, give it to someone directly on Eventbrite. MY CONTACT IS WRONG, HOW CAN I CORRECT THEM? You can edit your information directly from your Eventbrite account. I BOUGHT A TICKET BUT DID NOT RECEIVE MY TICKET YET. IS IT NORMAL? When you select ELECTRONIC TICKET as a delivery method, you will receive your ticket in your email inbox in the 48 hours following your purchase. We invite you to verify the contents of your junk mail as it is possible that you will find the email containing your tickets there. If you don’t find the email containing your tickets for Lolë White Tour® On The Road, we invite you to contact Eventbrite customer service directly from your account. Travel light! A water bottle and a light white cover-up is all you need to be prepared for the yoga session. – We will provide you with a yoga mat. – Remember to bring your ticket: you can show it to us on your mobile device and you can print it. – In case of rain, consider bringing a light white jacket or a white rain poncho. – Please feel free to use your phone (on silent mode) to share the love and peace of this very special yoga session: #lolewhitetour On The Road. – Money in case you would like to buy a souvenir or food. – Remember to dress all in white as a symbol of peace. ARE CAMERAS AND PHONES ALLOWED? We encourage participants to snap images of the Lolë White Tour® On The Road. Share your photos on Twitter, Instagram and Facebook, and spread the Lolë love: #lolewhitetour On The Road. Don’t forget to put your phone on silence mode. WHAT IS THE MINIMUM AGE REQUIRED TO TAKE PART? We do not impose any age restrictions. In order to enjoy the Lolë White Tour® On The Road experience, you just need to be able to sit, bend, stand up and relax for 60-90 minutes! 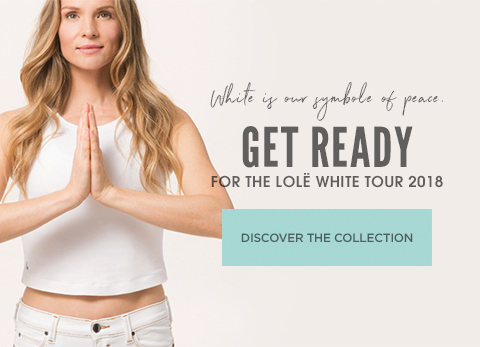 CAN I TAKE PART IN THE LOLË WHITE TOUR® ON THE ROAD EVEN IF I AM A YOGA BEGINNER? We created this event to bring people together: all participants are welcome, no matter their level of expertise! 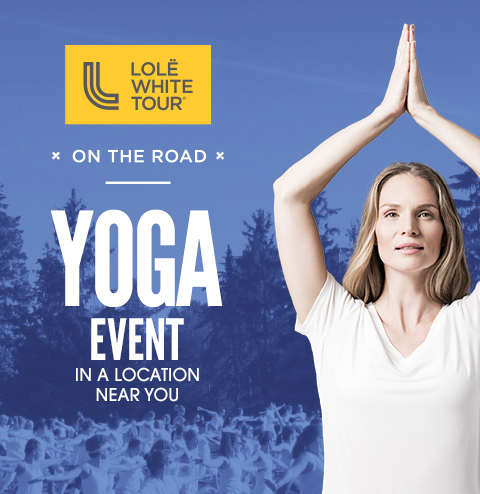 The Lolë White Tour® On the Road is actually the ideal opportunity to try yoga for the first time.